There is a bug in Ubuntu Saucy that prevents the usage of the IR remote with the appleir device driver (bug reporter was using a Mac Mini). It causes a kernel NULL pointer dereference on the first button press on the remote. The system locks up on the first button press on the remote, and prints an Oops message. As described in the bug report, simply using pressing the button on the remote reproduces the bug. After upgrading to Ubuntu Saucy (32 bit), I am able to reliably reproduce a crash by pressing any button on the IR remote of a Mac Mini. The system is running XBMC and using LIRC to handle the remote. The system locks up on the first button press on the remote, and prints an Oops message if I switch to a virtual terminal first. The same happens if I exit XBMC and shut down lircd first. If I boot to the 3.8.0 kernel from Raring, the problem does not occur. The dmesg output also shows non fatal intel_pipe_config_compare warnings that appear to be identical to bug 1211976, but I'm not sure if they are related. The oops doesn't seem to be written to the log, so I've attached a photo for reference. I've also included the dmesg log from right before I triggered the oops. I've tried the 3.12-rc6-saucy kernel, and was able to reproduce the bug. On the first IR command from the remote, I get the same NULL pointer dereference in input_event with the next few call frames in the hid_appleir module. So, it looks like one big difference is that the hid-appleir driver didn't exist in the 3.8 kernel, and presumably LIRC was programming the chip directly before. So I guess either (a) the driver is broken, or (b) LIRC is still trying to program the chip directly, and manages to confuse hid-appleir. I guess I'll see if I can disable the driver and see what happens. I tried out a test kernel from henrix at http://people.canonical.com/~henrix/lp1244505/v1/ which also exhibited an oops. The stack trace was a bit longer with the top of the oops scrolling off the screen, but it still contained the appleir_raw_event and key_down frames. I also tried disabling LIRC and booting with the stock Saucy kernel, where I wasn't able to reproduce the crash via the remote. I then tried blacklisting the hid-appleir driver and having lircd start. This time, lircd complained about not being able to open /dev/usb/hiddev0. Presumably some other driver bound the device to provide raw HID access in the Raring kernel. I've reported this issue upstream (https://lkml.org/lkml/2013/10/29/355), and Benjamin Tissoires has provided a patch for testing. It is a 3.11.0-12.19 kernel with the patch provided by Benjamin. James: could you please give it a try? Thanks. I've given the new kernel a try, and was no longer able to reproduce the crash. The hid-appleir driver seems to be correctly generating keypress events, and LIRC still seems to be able to access the raw hiddev device. 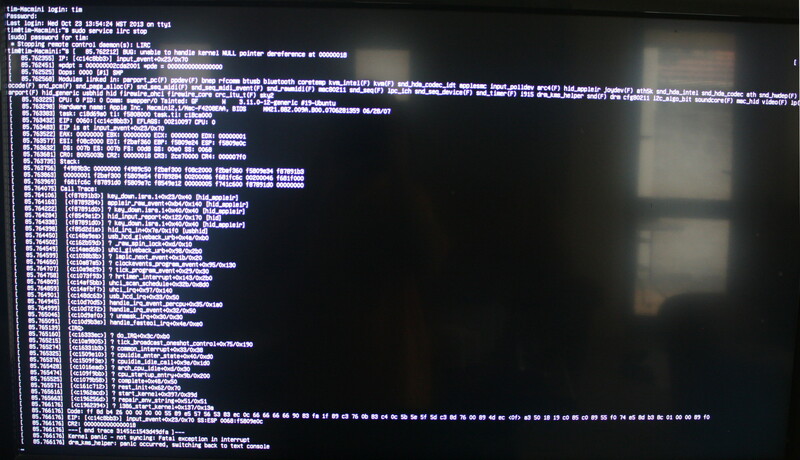 This gives me double input in XBMC, but that is clearly a problem with my local configuration rather than a kernel problem.